Hoary Marmots are large ground squirrels mainly found in the mountain regions of United States. These rodents are sometimes called “the whistlers” or “whistle pigs” because they make a low pitched sound to warn other members of their colony of any potential danger. Olympic, Yellow bellied and Vancouver Island Marmots are the closest relatives of the Hoary Marmots. These are one of the largest species of marmots found on earth. Body: The bulky fur covered body has short, heavy limbs. The male marmots of this sexually dimorphic species are usually much larger than females. Size: The total length of an adult Hoary Marmot (including the tail) is somewhere between 62 cm and 82 cm (24 to 32 inches). The tail length ranges from 17 cm to 25 cm (6.7 to 9.8 in). Weight: These marmots are known to hibernate during winter, surviving on the fat reserves of their body. Due to this reason, the body weight of these animals varies from summer to winter. They weigh around 8.3 lb (3.75 kg) in May and around 15 lb (7 kg) in September. Fur: Their whole body is covered in grey, black and brownish fur. 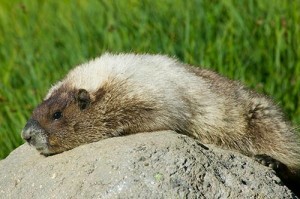 This species is called the ‘Hoary’ Marmots for having silver white fur on their shoulders and upper back. The long guard hair provides insulation to keep their body warm. Head: They have a broad head with small eyes, ears and a white nozzle. The upper part of the head is covered in black fur. The rest of it has brown fur except for some areas around their mouth and chin where the fur is white. Feet: The small black feet of these marmots have hairless pads. The curved claws on their fore-feet are slightly larger than those on their hind feet. This species is mainly found in the northwestern regions of contiguous United States as well as Alaska and Canada. Different subspecies of these Marmots are found in various regions of British Columbia, Yukon, Cascade Mountains, Montana and Idaho. The Hoary Marmots prefer mountainous environments with green tundra vegetation. They can be found in mountain slopes and hillsides near tree line at elevations up to 2500 meters. They mainly live in Krummholz forest patches and alpine meadows dominated by herbs, grasses and sedges with an average home range of 35 acres. This montane species of marmots have many adaptations that help them to survive in their environment. The hairless pads on their feet allow them to move easily in their rocky habitation. Hibernation is another adaptation to fight extremely cold weathers and low amounts of food available. This herbivorous species principally feed on flowers, leaves, grasses and sedges. These marmots have some interesting behavior pattern. They live in colonies with each group containing up to 36 Hoary Marmots. Each colony includes one dominant adult male and up to three female Marmots. They live in burrows. Usually, a large burrow (hibernaculum) is used by the whole colony during hibernation. Social behaviors like wrestling, play fighting and nose to nose touching can be seen among these Marmots. Members of different colonies of this species are hostile towards each other. Hoary Marmots are a vocal species with seven different varieties of call including whistles, chirps and growls. They make whistling sounds to warn their colonies of any danger. They like to bask in warm sunlight. However, they take shelter in their burrows when the weather is exceptionally warm. The reproductive season starts in May when they start emerging from their hibernation burrows. Usually, reproduction takes place at alternative years. Each litter of these rodents contains two to five young marmots. The young ones come out of their birth den after three to four weeks. Young and sub-adult Hoary Marmots live with their birth colony until they are two years old. They become reproductively mature at three years of age. The average lifespan of this species is 8 to 12 years. Birds and animals like golden eagles, bears, wolves, coyotes, foxes and wolverines prey on this species. There are three recognized subspecies of this species. These mammals are known to hibernate during winter. Their hibernation lasts at least seven to eight months starting around September. They immerge from their hibernacula or hibernation dens in May. 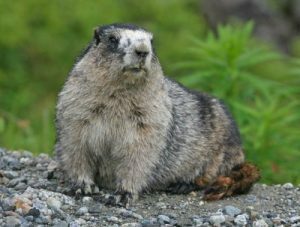 The fat reserves of their body help the Hoary Marmots to survive during hibernation. Due to this reason, their body weight decreases at the end of each hibernation period. One needs to check the state laws in order to keep a Hoary Marmot as pet because it is illegal to keep them without proper wild animal license. In case someone finds an orphan Hoary Marmot, it is best to provide for it and then set it free in its natural habitat once it becomes able to survive on its own. 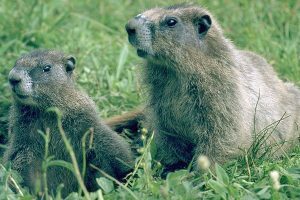 Here are some information about housing and feeding these marmots when they are kept as pets. Housing: They should be kept in a semi-natural enclosure. One can use a large wood crate to build a house with a door for them. The crate should be spacious enough to allow the pet marmot to move around and sleep in it. One can put old socks and paper towels inside the crate to make it a better home. It is important to prevent the Hoary marmot from entering the neighbors’ backyard. Feeding: It is easy to feed these herbivorous rodents. One can feed them with apples, carrots, alfalfa and celery. Caring: One can occasionally bath the pet marmot as they are often infested with fleas and mites. Here are some interesting facts about these large rodents. They are the largest ground squirrels found in North America. Hoary Marmots molt or shed their skin sometime between the early and mid summer. 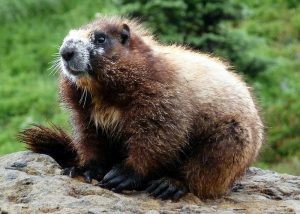 The London Mountain of British Columbia was renamed as Whistler after these whistling marmots, to increase the popularity of the place. These marmots remain quite at ease in the presence of humans. This species is listed in the “Least Concern” category by the IUCN as there are no immediate threats to the existence of these animals. Here are some images of the Hoary Marmots for you to find out more about their appearance. The Hoary Marmots are an incredible marmot species much larger than the average ground squirrels. They are one of the most interesting species due to their size, behaviors and adaptations.